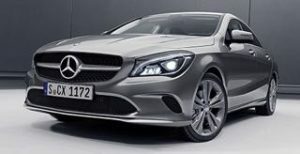 The Mercedes CLA is a four-door coupe and 5 door estate (shooting brake) version of the A-Class hatchback. 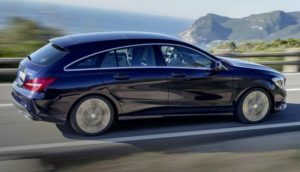 Rather than looking like an A-Class with a boot, it’s more like a shrunken replica of the stylish Mercedes CLS, and is very much the head turner in its own right. The CLA is a front-wheel-drive, which bucks the long-standing Mercedes tradition of creating cars with a front-engine, rear-wheel-drive layout. The CLA is a direct competitor for the understated, yet delightful, Audi A3. The CLA is a car to ‘cruise in’ rather than thrash around, even the comfort suspension setting is still a little firm for the British roads, despite this the CLA offers good grip in corners and the steering is progressive and well weighted. Inside there is room for four adults, though the taller occupants may find the headroom a little tight particularly in the rear of the saloon car. Boot space is an ample 470 litres in the saloon and 495 litres in the estate, if ease of access to the boot is an issue then the shooting brake is the car for you as the saloon suffers from a high lip and awkward opening angle. The CLA comes in a single trim line, AMG Line Edition, which has 18 inch AMG alloys, a choice of driving modes: ECO, Comfort, Sport and Individual, front brake calipers with ‘Mercedes-Benz’ lettering, Halogen headlamps, Lowered comfort suspension (lowered by 15mm rear and 20mm front), reversing camera, 7 inch Media Display, 12 button multifunction leather steering wheel, AMG floor mats with red stitched edging Brushed stainless steel sports pedals with rubber studs, sports seats in artificial leather with red contrast stitching and automatic climate control. There is no DAB radio or sat nav installed but do provide preparation for the Garmin MapPilot, a pre-loaded SD card that can be purchased from Mercedes for £495 (£50 from third party sellers). Apple Carplay/Android Auto is avaialble to run Sat nav through your smartphone. The CLA has a single petrol choice, a 1.6 litre petrol (badged as CLA 180) that produces 120 brake horse power that can propel the car to 62 miles per hour in a very respectable 9.0 seconds and offer a claimed combined economy up to 45.6 miles per gallon as a 6 speed manual or 7 speed twin clutch automatic. The same engine is avaialble (in Coupe) as a CLA200 with 154 bhp that can return 44.1 mpg and reach 62 miles per hour 8.2 seconds, the torque increases from 200Nm to 250Nm. The New CLA is being released in Summer 2019, but price increases in the retail cost may prevent it from joining the Scheme, Prices will start from £30550. Only a single CLA is avaialble this quarter.